I have been up to my favourite part of world this past weekend. Saturday was spent around Hopton Titterhill in South Shropshire. I had a very enjoyable walk from the main cark round the hill and down the eastern side to the restored castle keep at Hopton Castle where I sheltered from a heavy rain shower. I then continued past the church and along the road towards black hill, up towards Obley then back to the car. It wasn't too cold and the sun was almost warm when it was out, but at one stage I did have to shelter in an old barn from a torrential downpour and almost gale force winds. A day of contrasts. Wildlife notes: as I drove up through the village in the early hours of the morning I came across a hedgehog wandering around; found a dead goldcrest which actually looked so small and almost cute (not idea why it had died); and came across a couple of the largest wood ants nests I have seen for many years - one must have been almost 4-5 ft high - very rarely have I seen any in this part of the Welsh border. Sunday was a gorgeous sunny day for the most part and again it wasn't that cold. 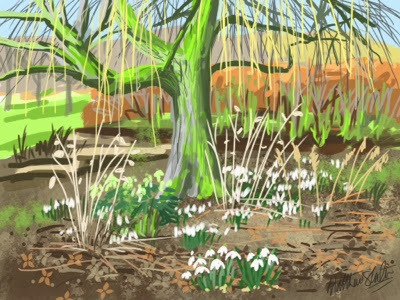 The above picture was drawn in the walled garden at Croft Castle (NT): weeping willow, snowdrops, hellebore and honesty.